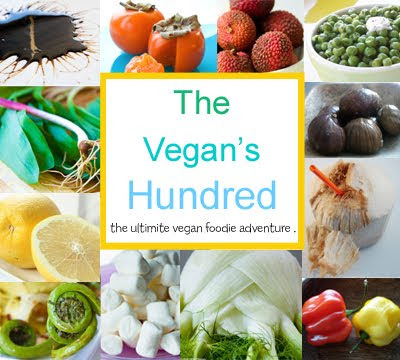 The Vegan's Hundred. 100 Foods you Should Try. A while back, Andrew of the foodie blog Very Good Taste, posted an article called the Omnivore's Hundred. The "Omnivore's 100" is a list of Andrew's interpretation of the 100 foods every omnivore needs to try. The list gathered a loyal following as bloggers and foodies everywhere began following Andrew's instructions to re-post the list and join in the challenge. He instructs everyone to cross out things they'd never eat and bold the foods they have already conquered. Fun right? Well as much as I loved the idea, as I began to read the food list I knew I couldn't participate. Venison, snake, goat's milk and haggis. Definitely NOT vegan-friendly. The Challenge: Just as the omnivore list does, I challenge you to re-post this list and participate in the challenge! Cross out or italicize all the foods you would never eat, bold foods you have tried and update your list as you participate in trying all the foods on my Vegan's 100 list. Then if you'd like, post a link to your list in my comments section so others can see how you are doing. I tried to stay true to the original omnivore 100 by leaving on a few of the vegan food items on Andrew's list. However, since most of the foods were not vegan, there was a lot of space to fill! My criteria for food items were that they had to be either a unique whole food (like a lychee) or a notably stand-out-delicious way to prepare a common food (like scrambled tofu). 4) Optional extra: Post a comment on this post linking to your results. I hope you will join this vegan foodie tasting adventure. Post the link to your list in the comments-if you have any questions, leave them in the comments as well! ...lets show the omnivores that the question "what do vegans eat?" definitely has over 100 amazing answers...! 26. Raw Scotch Bonnet (habanero) pepper (just a bite!...hot!